New York Governor Andrew Cuomo has "raised eyebrows" with his claim that Superstorm Sandy suffered worse property damage than Katrina. The New York Times today sorta debunked this claim with a side-by-side comparison of the two storms, although on electrical outages Sandy wins hands down. No question that Katrina was a worse storm by meteorological standards, and the deaths were much greater, which Governor Cuomo concedes. What he argued (based on my having seen the replay of his remarks on MSNBC) is that the scope of the damage was greater. He didn't actually say that the dollar value of the damage in New York, New Jersey and the other states that have been hit by Sandy is greater. Let's look at an updated chart of the top 20 storms in the U.S. since 1900 in current dollars. In my recent posts I attempted to update a 2010 table of the top storms. Through a comment on my last post I was sent to this table, for which I am grateful. It is updated by the person who prepared the original table, Roger Pielke, Jr. The method he uses is described in a 2008 paper cited in the footnote to the table in last post. I cited this work frequently in examining the Hurricane Irene damage data. The numbers above are easy to use. Just plug in a number for the estimated damage in current dollars and you have the ranking of Superstorm Sandy in fair historical terms. If you add together the $32.8 billion New York damage and the $29.4 New Jersey damage, the $62.2 billion total takes you to the #6 spot. Definitely, the NY $9.1 billion aid request for flood surge prevention (and the New Jersey equivalent) should be excluded from the total. Pielke argues that to be consistent, one should also exclude from damage numbers any business interruption costs, because storm damage estimates historically only included the value of destroyed assets. If business interruption is excluded, much of the $62.2 billion will be excluded. 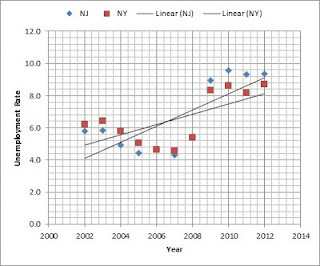 But there are other states affected by Sandy (the Connecticut shoreline was badly hit in some places), and adding in their damage will top up the final number. 1. There is a bias against long-ago storm-damage numbers, but there is also the bias of ignorance that governments operated under 112 years ago. They knew less about weather patterns and were less prepared. So in comparing the viciousness of the storms, they seem less terrible today for the same level of severity because we know how to prepare. If no one was ready for Superstorm Sandy, can anyone doubt that the death rates would have been much higher along the shore - more than 200 miles of shoreline from Cape May through to Montauk? 2. Adjusting for inflation is a no-brainer. But Pielke has adjusted for more than that, for the value of property because of rising density. Someone could argue he has over-adjusted. 3. Katrina was recent, so the business-interruption problem doesn't apply. Recent practice is for business-interruption and loss-of-use to be insurable and to be a legitimate damage. Think of it this way: When your house collapses in a storm, you have two problems. One is you need to rebuild. The second is that you need a place to stay. Insurance companies tend to pay for both. The same applies to business. If my store is flooded, I lose inventory and I have to spend money repairing electrical wiring and walls etc. Meanwhile I also lose business while I am fussing about these problems. Insurance policies tend to pay for both of these problems. I think that business-interruption is reasonable damage cost to include in these estimates. 4. But Governor Cuomo's request for $9.1 billion relates to a different kind of problem. The storm reveals inadequacy in the infrastructure and makes it imperative to address it. Think of the homeowner whose house is destroyed. The town decides not to let the beach-dwellers rebuild, or to require higher standards of construction. The town may offer the homeowner some compensation for what amounts to a taking way of a right to use of property. But an insurance company could refuse to reinsure, which might amount to the same thing if a homeowner needed to borrow to rebuild (banks typically want their mortgaged properties to be insured). The point is that remediation of adverse conditions is not a new piece of damage - the damage merely exposed a problem that was there all along. That's why I don't think it should be included in damage estimates. Bottom line, I think that the damage caused by Katrina was similar to that caused by Sandy, apart from loss of life where there is no comparison. The reason is that Sandy affected a larger area and it hit two of the five biggest business central business districts in the nation - downtown and much of midtown. It may not be social justice, but economics uses the yardstick of dollars rather than windspeed or pain and suffering. Governor Cuomo may have a case that the dollar value of the cost of damage to property was greater for Sandy. A counterargument is that the levees were broken around New Orleans and that will take a huge amount to replace. But isn't the additional cost similar to the problem with flood prevention in New York? To rebuild the levees, they will have to be higher and stronger. It's not just the damage we are talking about, it's the revelation that prior defenses were inadequate. The whole issue of infrastructure "needs" is hugely important, but it is separate from the assessment of damage as traditionally computed. Source: CityEconomist insertion of Sandy into the list, with $62.4 billion being the inflation-adjusted 2010 value of 24 states' costs. Original table from NOAA, National Weather Service, National Hurricane Center, Pielke et al. (R. A. Pielke, Jr., J. Gratz, C.W. Landsea, D. Collins, M. Saunders, and R. Musulin, 2008: "Normalized Hurricane Damages in the U.S.: 1900-2005." Natural Hazards Review, 9, 29-42, cited in Blake and Gibney, 2011). Pielke et al. adjust historical data for inflation to 2010, wealth per capita and population. Where does $62.2 billion for NY and NJ put Sandy's rank among U.S. hurricanes? Governor Christie of New Jersey late yesterday afternoon announced $29.4 billion as the cost of Sandy to New Jersey's 127 miles of coast. With Governor Cuomo's previous announcement of $32.8 billion, the total for these two hardest-hit states is $62.2 billion. 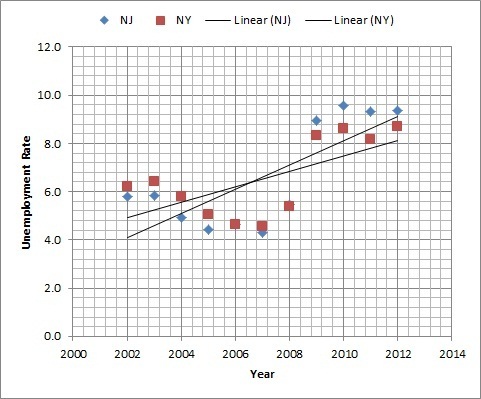 The NY-NJ estimate of $62.2 billion in 2010 equates to $66 billion in 2012 dollars according to the BLS cost-of-living converter. So for the total impact to be equal to $62.2 billion in 2010, the other 22 states affected by Sandy will need to come up with impact numbers that add up to $3.8 billion, which is a highly probable average of $170 million per state. If the NY or NJ estimates rise, or other states have much higher costs that bring the total above $75.7 billion, Sandy could rank #4. But it was just a tropical storm by the time it hit landfall in New Jersey, so Sandy is unlikely to get close to the Galveston Hurricane of 1915. Note that century-earlier estimates are generally based on physical damage only, whereas later economic impact numbers, after WWII, include impacts such as business-interruption costs because these became widely insured events. In addition, dollar-value rankings must be adjusted for inflation, as is done in the table above. There is no sense in using unadjusted dollar numbers that go back to 1900. The most costly U.S. hurricane ever was the 1926 Great Miami Hurricane, which cost $164.8 billion in 2010 dollars according to the National Hurricane Center. Last year Hurricane Irene has been widely quoted as having had an economic impact of $15 billion and has been improperly ranked #5 highest in damage. Their numbers were not adjusted for inflation. Irene did not rank even in the top 10 after adjustment for inflation. (See my comments last year http://www.huffingtonpost.com/john-tepper-marlin/measuring-irenes-damage_b_940033.html). was the worst hit relative to population. 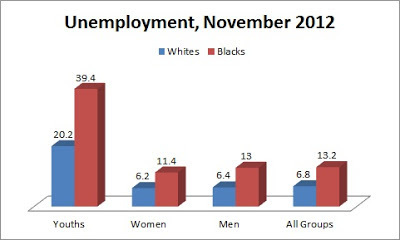 Source: CityEconomist, from FEMA data. Governor Christie of New Jersey announced late yesterday (7:41 pm posted on Philly.com) that the cost of Superstorm Sandy so far for his state are $29.4 billion. So that is $62.2 billion for the two hardest-hit states, adding in $32.8 billion for NY. The subsequent addition of $9.1 billion for NY by Governor Cuomo for flood surge prevention doesn't belong in the damage column. We know that some counties within New Jersey were much harder hit than others, although every county in the state was declared FEMA-eligible. The worst-hit counties are Cape May, Atlantic, Ocean and Monmouth - i.e., the four southeastern coastal counties. The $29.4 billion New Jersey cost will be borne by state taxpayers, the Federal Government and private businesses and individuals. Every one of the various forms of coverage of these costs comes with a price tag. The question is who pays for them and when. For a national calamity, the nation steps up to pay some of the bills. - Private insurance will cover some of the (1) property damage above the deductible and (2) business interruption and loss of use. But coverage will be harder to get in future; deductibles will rise; premiums will increase. The NYC Comptroller's Office showed that how this happened after 9/11. It makes sense that casualty insurance companies over time have to match their premiums to their claims, especially when interest income is low, so some of the premium hikes are reasonable. - If private utilities are self-insured or their premiums go up, they will use this in their rate base when they apply for rate increases. - Government payouts at all levels will have to be financed from the expense budget or with bonds. Either way, they impose a budgetary burden now and later. - The Small Business Administration loan program will either collect back from businesses or will have to absorb the loss and get funding from the federal budget. - FEMA and the flood insurance program within its umbrella will need to get more federal funding for amounts not already set aside for claims. - The uninsured and unreimbursed portion of losses will be absorbed by individual businesses or households. In New Jersey alone, FEMA has recorded more than 70,000 homes "affected" by Sandy. Many of these homes will be expensive to repair or rebuild. Many are uninsured because insurance may have been hard to get or too expensive. - Because of the high costs of rebuilding infrastructure, rebuilding near water may become more difficult. Private homeowners may see their property values decline. Within all the big numbers are many private tragedies, people who are faced with bills they can't pay or rebuilding that they may not be permitted to do. As usual, small businesses and struggling households are the hardest hit. Only a few get attention in the media. Americans help their neighbors in time of need. In the end, we all bear some of the cost but some people bear more than their share. PCS reports that insurance claims for Sandy are only $11 billion. This is good news for casualty insurance companies and holders of catastrophe bonds (which don't pay off as much if a catastrophe happens). More broadly, the lower-than-expected number (Eqecat said it expected $20 billion in insured losses) could mean a number of things: - Huge losses are uninsured, which is quite possible because so much of the hit was taken by individual homeowners near water. Those properties are difficult and expensive to insure, which means many homeowners self-insure. - The Federal flood insurance program (FIMA, part of the FEMA system) may be getting many claims. - States and localities will be filling in to repair damage and take care of people made homeless and the costs will be filed with FEMA. - Homeowners may be slow to file claims. Or the Eqecat original estimate was too high. It was the basis for an economic-loss estimate of $50 billion that has been widely reported. NY Governor Andrew Cuomo has estimated $33 billion cost for New York State. NY City Council Speaker Christine Quinn used an estimate of $26 billion losses for New York City, after Gov. Cuomo released his estimate; her figure presumably is scaled to fit inside the statewide number. Still no estimates for New Jersey. Governor Chris Christie said he expected to release them by Wednesday, November 21. No sign yet in Googledom of these numbers. FEMA has been releasing data on the number of homes that have been damaged in any way. SANDY | Restore to NYC the Dutch Windmill Expertise! The amazingly detailed interactive map in The New York Times today shows all the areas near water in New York City where buildings suffered from flooding during the surge of water that occurred because of Hurricane Sandy. Governor Andrew Cuomo has assessed the damage statewide as $33 billion and has called for $30 billion in Federal aid. Speaker Christine Quinn has put the New York City damage (which would fit within the statewide number) at $26 billion and has called for $20 million and a surge-control system to prevent 15-foot waves from cascading through New York City streets. spices–eaten Dec. 6, St. Nicholas Day. 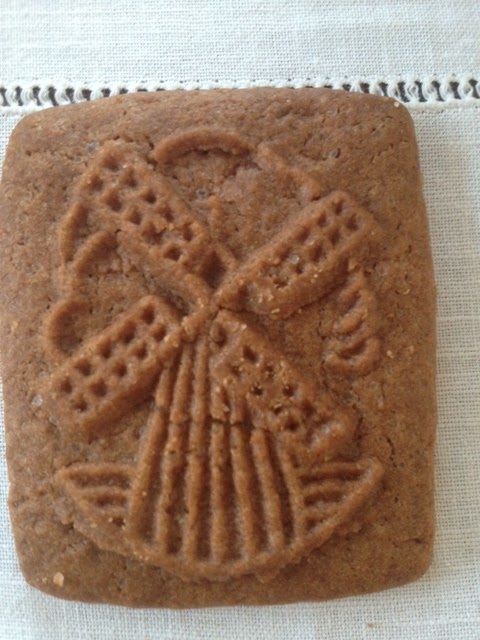 Bring back the Dutch! They first came to New York when the Dutch East India Company in 1609 sent English navigator Henry Hudson to explore the river now named after him. He went far upriver into what is now Canada and wrote back to his sponsors that beavers lived on the river in abundance. A Dutch settlement, New Amsterdam, was founded in Manhattan largely to support trapping beavers and sending them to Europe for women to wear. 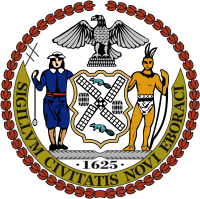 The New York City coat of arms has two beavers on it as well as a four windmill wings in honor of the Dutch settlers. Seal of the City of New York.. Note windmill and two beavers. Which brings me to the windmill. 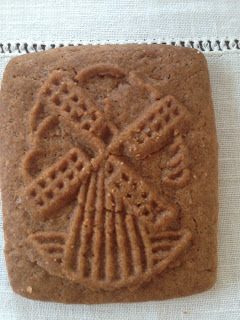 The Dutch were famous for their windmills because that's what kept the water out. Much of Holland is at or below sea level and the windmills were used to pump out the polders, the areas surrounded by dikes. 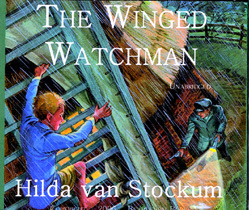 My Rotterdam-born mother, Hilda van Stockum (1908-2006), wrote The Winged Watchman about a family that lives in an old windmill during the Nazi Occupation. Two boys aged 10 and 14 join the Resistance. The book shows how the windmill did its work when the electric mills could not operate for lack of power. 1995 and was optioned for a movie. This book by my mother has special relevance in light of Hurricane Sandy, which caused most of its damage because of flooding and caused most of the lost economic activity because of the electricity outages. The Dutch have been facing these flooding problems for a long time. Their world preeminence in building windmills to pump out water made them experts in making sails for the mill wings. This helped make them a naval power for a time. After the English took over the Dutch colony in 1664, they renamed it New York. The city grew most rapidly when the Hudson River became the gateway not only to upstate New York but also, after the Erie Canal was built, to the Great Lakes. The Dutch have developed many kinds of technology to deal with today's challenges to their flood-threatened system of polders. New York needs to get their advice. And The Winged Watchman provides both a history of the importance of windmills in Dutch history and an education in the ways to deal with flooding. 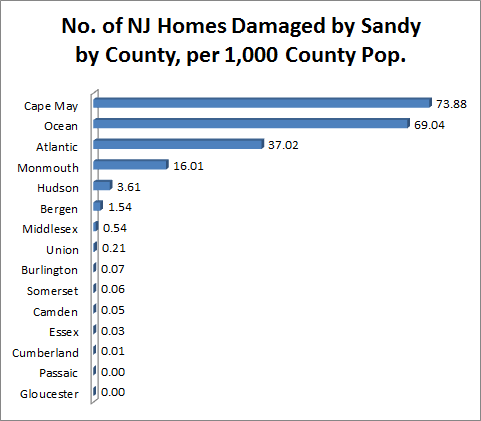 SANDY | Cape May–Most Homes Hit Per Pop. As I noted in my previous post, Ocean County had the greatest number of homes damaged by Sandy. 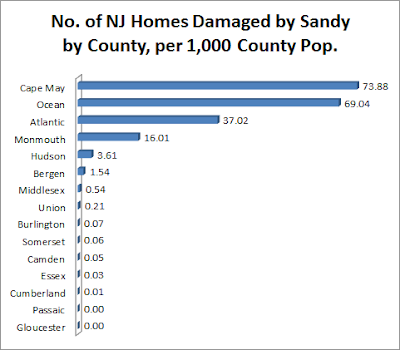 But relative to their populations, Cape May is the hardest hit of all the New Jersey counties, with nearly 74 homes damaged per 1,000 population, ahead of Ocean County with 69 homes and Atlantic County with 37. 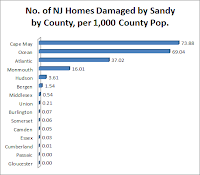 Monmouth County is next with 16 homes damaged per 1,000 population, Hudson County with nearly 4 homes per 1,000 population, Bergen County rounded to 2 homes and Middlesex County to 1. These seven counties are the only ones with a number that rounds to 1 or more. Every one of these hard-hit counties is on the Atlantic Coast. granted to use this chart with attribution to CityEconomist. Using aerial surveys, FEMA reports that 71,770 homes were damaged in New Jersey. The damage is classified as "Affected", "Minor", "Major" and "Destroyed". Of the New Jersey homes that were "Affected" or worse, 40,001 homes – or 55.7 percent of them statewide – were in Ocean County, which above Atlantic County and below Monmouth County on New Jersey's Atlantic coast. Although the eye of Sandy made landfall in Atlantic County below Atlantic City, it is not surprising that the brunt of the impact was felt in Ocean County. Hurricane Sandy was spinning counter-clockwise when it hit land. 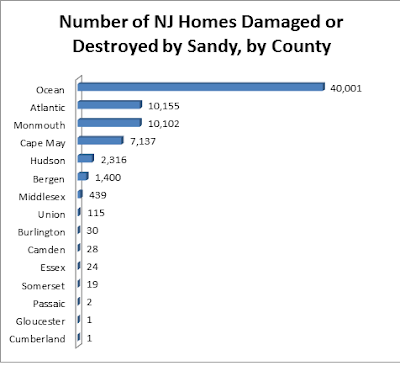 The damage to the two counties adjacent to Ocean County, Atlantic and Monmouth, was the same percentage of New Jersey homes - 14.1 percent. Cape May, to the south of Atlantic County, accounts for 10 percent of the damaged homes. These four counties account for 94 percent of the damaged homes. The death toll from Hurricane Sandy is shown in a useful map in the Sunday print edition of the NY Times. However, it cuts out after a 65 mile radius of New York City and does not show the three deaths in Atlantic County, where the hurricane made landfall, just south of Atlantic City. The interactive map on the NY Times website has the full map without an arbitrary cutoff. Governor Christie said that Hurricane Sandy was America's second-worst ever. That is true only if you use property damage as the basis for comparison and you ignore the fact that money amounts in 1900, which would be really stupid because U.S. dollar values need to be adjusted for inflation over such a long period. I have already noted this (see below). Doesn't Gov. Christie read my posts? ESB to WS | "Mark to Market"
Day. Photo by JT Marlin. November 12, 2012–I was looking at the Empire State Building colors and was sure the message was: "Blue on top. Barack Obama won a second term. Get used to it." To the Wall Street hedge fund and private equity guys who in vain spent bundles of money trying to defeat Obama for threatening to raise taxes on the very wealthy, the colors say: "Mark to Market." In fact, of course, they need to go through denial (Wait for more ballots! Recount! Travesty!) and anger before they get to the Nirvana of acceptance. But the ESB management has kindly made it easy to find out what meaning ESB actually intended. You just have to go here to find out that the building is blue, white and red in honor of the Veterans' Day Holiday on Monday, not the election. They turned on the colors three days early. shows Electoral College votes on a bar graph. Photo by JT Marlin from his apartment. Like the election of the Pope, one can see the outcome of the election by looking at the top of the building. But the signal is not polluting smoke but the color of the building itself. The lights at top show progress toward the magic of the 270-electoral-vote target. The light show is being provided by CNN. The left side of the top of the building shows Romney Electoral College votes in red and on the right the Obama Electoral College votes in blue. For much of the evening the lights under the bar graph section of the building were red, white and blue. When Obama reached 270 electoral votes, the rest of the lights went to all blue. The bar graphs were made possible by new LED panels. This is the first use of the new lights. Many Americans would like to end the Electoral College and use the popular vote to decide the election. In that case the bar graph would take on a different meaning. Mayor Michael Bloomberg is right and David Brooks was wrong. Bloomberg has endorsed Obama for re-election today, for his efforts to do something about climate change. Brooks was dismissive of Obama's green jobs program in a NY Times piece. Brooks argues that people are gloomy about green tech and Obama is to blame. He also mysteriously blames Al Gore, because he was so successful in promoting green issues. What's wrong with green jobs is the GOP opposition to it in Congress. 1. The green jobs program was not such a failure–most of the investments are working as well as anyone expected from a new government program. 2. The program was predicated on there being a price for carbon, which Brooks supports. The failure to pass any bill on this topic during Obama's first term is the result of GOP congressional intransigence. The green jobs program has had more of an impact than Brooks allows. He describes the green jobs program solely as a green-tech program, and this leads him to focus exclusively on renewable energy. Yes, renewable energy is mostly a highly technical area where it is hard to put to work very many people quickly. The workers who assemble and install wind turbines, for example, are likely to be skilled steelworkers. It takes time to recruit and train skilled workers. Therefore progress will be slow. In its analysis of the benefits of various alternatives to pursue environmental solutions, increasing the efficiency of U.S. energy use was at the top of McKinsey & Co.'s list. State governments are pursuing this concept through promotion of energy audits, house by house and neighborhood by neighborhood. Residential and commercial developers are seeking for their new buildings various green certifications, such as LEED and EnergyStar. Economists have shown that the owner and renter payoff from energy efficiency is real and substantial. Companies like Johnson Controls have thrived by retrofitting older buildings with green remedies. Van Jones may have been hounded out of the White House, but his idea of training ex-offenders as a labor pool to work on environmental projects is happening. Superfund-site remediation is a significant employer of ex-offender trainees and I have personally seen this program at work in New Jersey. Obama came into Washington with a lot of ideas. He put health care at the top of his list and he got his program through the Congress. The problem he faced next is that the opposition in Congress did not want to let him get anything else through.